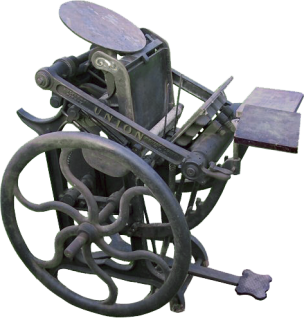 The Kelsey Union press was a larger size press (11″x14″ chase) with quite a few features missing on the Star model. The latching throw-off lever on the left side of the platen allowed for quick action to go from impression to off-impression as it was tied to an eccentric shaft behind the platen. The press also had a very upright bed, and a toggle mechanism which allowed considerable impression strength. It shared some aspects of the popular Golding presses, including a place to store extra rollers in between the feed table brackets.